While the publicity for Dean Koontz’s latest novel Innocence promises a “game-changing” departure from the norm for the veteran thrill-master, the reality of the situation isn’t quite as dramatic. Koontz doesn’t so much swerve into uncharted territory as apply his signature style and methodology to a more character-based story that proceeds more deliberately than some might be used to. Does this make Innocence radically different? That’s for long-time fans to hash out on the message boards. Although it takes some time, Innocence definitely works: a modern Gothic fairy tale set against the hypnotic backdrop of Manhattan after dark. Even though the narrator, Addison Goodheart, claims this isn’t a Beauty and the Best-type story, it’s definitely a twist on the old tale. Addison lives beneath the streets of Manhattan in a long-forgotten series of rooms fully furnished and stocked with necessary amenities: books, armchairs, and a kitchen. He’s 20 years old, alone for years since the death of his “father,” the man who rescued him after Addison was abandoned by his mother and found his way to New York City as a boy. During one of his many nocturnal visits to the New York Public Library, Addison encounters a black-clad girl running for her life from Ryan Telford, the curator of the library’s rare-book and art collections. Addison helps Gwyneth escape, and she reveals her dark history with Telford, as well as his shady side business selling antiquities from the library’s collection and pocketing the proceeds. He reluctantly agrees to help Gwyneth build a case against Telford which she can ultimately take to the police. Even as seemingly innocent opening scenes play out, shrouded in secrets upon secrets, the reader knows that a master storyteller like Koontz will gently pull the curtain back, revealing key details withheld until just the right moment. And, the payoff delivers. There’s one perfectly-timed, blindside of a twist that changes the complexion of the story and steers it into decidedly philosophical waters. For this reason, Koontz mostly pulls off this foray into literary fiction, shifting his emphasis to character over plot. His pacing is plodding in spots, and the deliberate way he builds the main character and narrator’s inner life is a bit methodical. But when the twist occurs, the payoff is worth it. Innocence is perhaps most commendable for the spell it creates through creation of mood. Koontz’s depiction of New York City by night is memorably haunted. The dark becomes a character with a life of its own, and every alley, every dimly-lit storefront, holds secrets and becomes somehow sinister. Addison’s narrative voice lingers over evocative details like steam rising from a sidewalk grate or the glow of a streetlight careening off slick city streets in a way that makes the setting spring to life, and forms a nimble contrast between the innocence of the main character and the experience of the city and the lives lived in it. Most impressive in the setting is the snow. Many of the novel’s key scenes take place as the city is blanketed by layers of white. Rather than a Hurricane Sandy-type chaos descending on Manhattan, these images of blizzards evoke the soft, gentle cleansing often symbolically attached to this weather. Similar to Ted Dekker, Dean Koontz is as reliable as they come for weaving thoughtful plots paced like thrillers, but with breathing room. 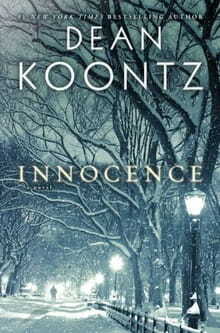 Innocence may slow the tempo, but remains another feather in Koontz’s cap.